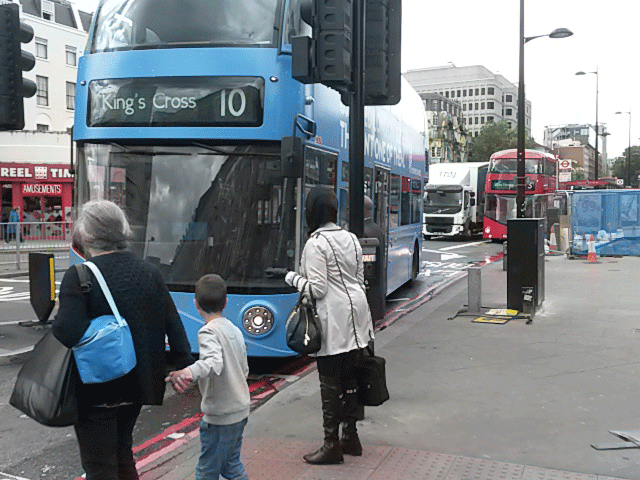 After widely publicised accidents and growing understanding about the impact of poor air quality, 2011-12 saw a flurry of activity from Transport for London in a bid to address the many and varied shortcomings of the King’s Cross traffic gyratory system. They held a public meeting and followed it up with various workshops. At these they promised to work with Camden and Islington councils to produce options for removing the gyratory and present these in Summer 2013. Shortly after that they delayed the 2013 consultation event until summer 2015. A few days ago they told me they were delaying the consultation until summer 2016. The same day their website was updated to say the event would now be held in winter 2016. TfL have long been a barrier to change here, with the drive towards traffic smoothing their priority. Traffic smoothing, aka Journey Time Reliability (for motor vehicles) is a means of encouraging motor traffic to flow through the road network thereby increasing the amount of traffic. This is called ‘induced demand’. For communities in London traffic smoothing leads to bad health; inaccessible, poor quality public realm; and disjointed communities cut off from important facilities. Are TfL involved in a conspiracy to keep delaying the King’s Cross gyratory and public realm proposals, particularly in the run up to the Mayoral election in May 2016? Do TfL hope that a change of Mayor will at least delay it if not put a stop to it altogether? Is this a war of attrition, are TfL wearing down the local community aiming to end our demands that the gyratory be removed and replaced with a safe, healthy and liveable public realm? Is TfL pandering to the more conservative (small ‘c’) folk out there who would prefer the gyratory stays, as it’s better the devil you know, or the Cassandra like voices who insist it’s not worth fighting for because nothing good will ever come of it? Let’s look at what’s happening behind the scenes and see how we can keep the pressure on TfL by making this an electoral issue for all Mayoral candidates. It appears that TfL had not expected such commitment from Camden and Islington councils when they made their offer of working together back in 2012. Both councils have pushed TfL further than was expected resulting in delaying presenting options for gyratory removal and public realm improvements to summer 2015. This is apparently also the reason for the further delay to winter 2016, although it sits uneasily that this reason is being used for both delays. A bit of digging however reveals that TfL made big changes early this year in the way it’s approaching King’s Cross gyratory removal and public realm improvements. “Until the end of last calendar year, TfL was progressing the King’s Cross gyratory feasibility study [almost] internally, with occasional engagement with the boroughs. This involvement left [both councils] with many questions about the presented design options and the methodology TfL was following. It was unclear why certain design decisions had been taken, and I did not feel confident that all possible design avenues had been fully explored. From our experience with Archway gyratory we know that only a very thorough study, exploring every possible design option, could lead to a successful outcome. Unhappy about the design approach and limited involvement of the boroughs, and unclear about the designs, I would not have been able to properly brief and advise Members and answer questions from the local community. “Fortunately TfL listened to our concerns and since the start of this year TfL has set up a joint project design team and working group with full officer involvement from both Camden and Islington throughout the entire design process. Whilst this is very time consuming, it is so far proving to work really well. I now feel confident that all possible scenarios are being properly tested, and I will be able to explain why the various options are (or are not) possible and what the trade-offs are. To assist the boroughs in resourcing this, TfL has agreed to fund an officer post in each borough for a period, to which we are now recruiting. “Unfortunately this has meant that we had to take a step back so that TfL could brief us on the full design process from the start. As a result, there is [another] delay in the programme and the consultation date has slipped. This is disappointing and must be very frustrating for members of the local community who have been waiting to finally see some proposals for quite a few years. 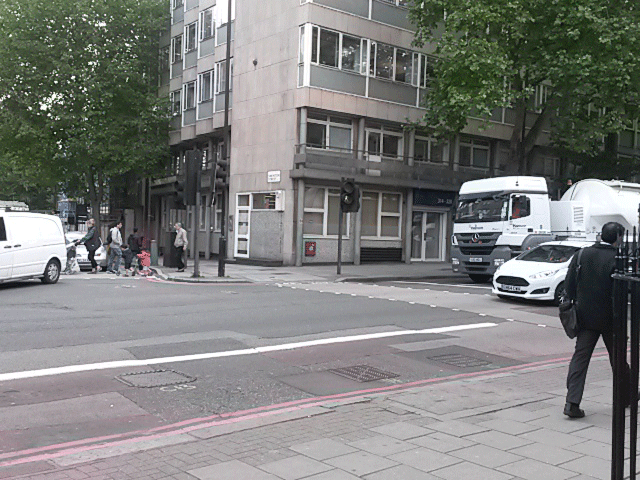 Euston Road junction with Gray’s Inn Road westbound. End of cycle separation, anyone spot the problem here? As with local authorities and parliamentary constituencies, King’s Cross is split into two Greater London Assembly constituencies. It would be wouldn’t it? Nothing is straightforward here. Both GLAMs are keen to know what’s going on. Andrew Dismore (GLAM Barnet and Camden, Labour) will table a question for the Mayor this month asking for clarification about the King’s Cross gyratory proposals process and it will be very interesting to see what the quality and content of the Mayor’s reply will be. Jennette Arnold (GLAM North East, Labour) has written to TfL also asking for clarification about King’s Cross gyratory removal and public realm improvements and is pressing them on the need to keep local people engaged and informed. Meanwhile, after a public consultation overwhelmingly in favour, Islington council implemented two way working on the south end of the Cally to Railway Street. 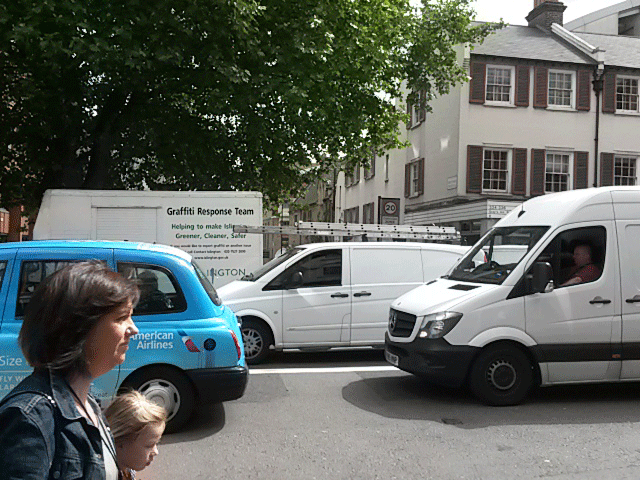 This is a part of the gyratory the council does have sole control over. It was intended to put pressure on TfL to speed up the gyratory removal process. It comprises a redesigned junction at Wharfdale Road, Killick Street and the Cally and new two way working on the Cally from Killick Street to Caledonia Street. 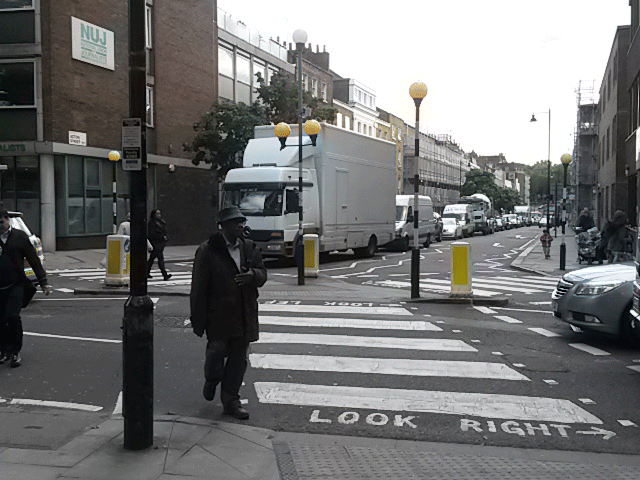 At the planning stage an equality impact assessment was made which concluded that reduced crossing distances for pedestrians at the Wharfdale/Killick/Cally junction would benefit people with mobility impairments. An environmental impact assessment was not made as the scheme would not increase the amount of traffic. The proposed two way traffic system was modelled using industry standard software and it found, although traffic would not increase, queues of traffic would at affected junctions. The queues that would build up were expected to be ‘within capacity for the whole network’. When comparing the traffic jams at Wharfdale Road with its counterpart at Acton Street at the south end of the gyratory this is certainly the case. Jams at Acton Street are way worse than those at Wharfdale. This will be of very little comfort though, to those newly affected. That the traffic lights at the Wharfdale/Killick/Cally junction have not been properly phased to suit the amount of traffic and type of traffic flow on Wharfdale Road has been a local disaster. When the lights at the west end of Wharfdale Road change, traffic quickly builds up into long jams at the new lights at the east end. A great deal of this traffic comprises buses, taxis and HGVs all spewing out vast amounts of particulate heavy diesel emissions. Local residents report children in particular are suffering worsened respiratory illnesses including asthma since two way working was introduced. It is quite possible this could easily be rectified by changing the priority for the traffic lights – as simple as flicking a switch. But the council fitted an automated system enabling the traffic lights to ‘see’ where traffic is building up and change accordingly. Unfortunately this ‘SCOOT’ system hasn’t worked, the council say it is blocked by scaffolding at a building site next to the lights. Although why they can’t just manually override the system until the scaffolding comes down isn’t clear. 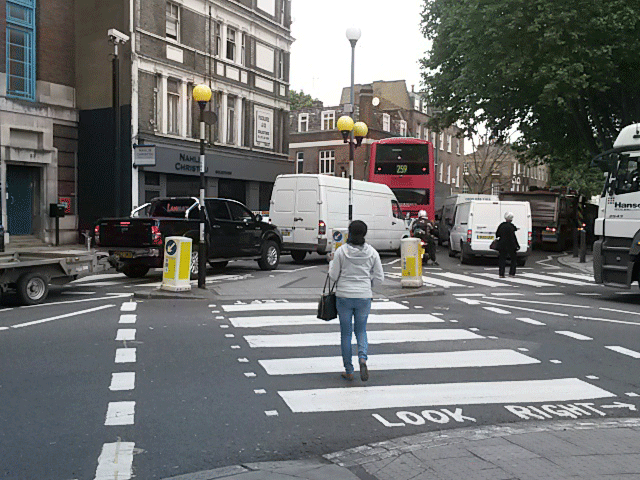 Residents have formed a local group, CallySouth, aiming to pressure the council to revert back to one way traffic on the south of the Cally and remove the traffic lights at Wharfdale Road. The main drive for this is to smooth the traffic flow. A public meeting to be attended by Councillor Paul Convery and council officers will take place at The Driver pub (on the first floor, no lift. Attendence limited to 60 people) at 7pm this coming Monday, all welcome but please sign up on their website so the organisers know how many people to expect. Unfortunately, smoothing traffic flow (aka improving Journey Time Reliability) won’t improve local air quality as this worsens when traffic increases. The King’s Cross gyratory controversy is not going to go away. Everyone putting their names forward to be a Mayoral candidate needs to get up to speed on what they intend to do with a planning and consultation process that has gone on for far, far too long. Do candidates intend to produce the goods here or will they get off the pot? TfL needs to inform and engage with the local community throughout the process. To date their ability to do this has been shambolic. How do Mayoral candidates propose to make TfL’s work actually transparent and accountable to the people they serve rather than allowing them to hide behind what has turned out to be an opaque shield of statutory ‘scrutiny’. It should not be down to volunteers on this community website to have to dig for information TfL should be feeding us and all other information outlets on a regular basis. King’s Cross has always been a densely populated area with high concentrations of elderly and disabled people. Population here is increasing at a massive rate. King’s Cross is more of a destination now than it has ever been and that draw will continue to increase over the next decade at least. The local population profile is changing fast too. The Bloomsbury campus and SOAS building on Penton Rise have been joined by the University of the Arts, various new student accommodation blocks and soon the Aga Khan University will arrive here. Young people from all over the world come to study and/or live here. They tend not to drive either. They walk, they cycle and they use public transport just like the majority of existing residents and they do that on dangerous roads that have not been fit for purpose for years. Not only is King’s Cross now known as an Arts Quarter, it has become a Knowledge Quarter too with the British Library, Guardian News Media, Google, Macmillan Publishing, the London Canal Museum, the Creative Industries Federation, The Crick Institute and the Institute of Physics among many others who have joined together to interact and share ideas in close proximity. There is nowhere else like this. This isn’t a time for feint hearts. King’s Cross is changing at blistering speed. You cannot allow this wonderful area to be completely hobbled by a killer 60s road network. You cannot allow the A501 inner ring road to funnel vast amounts of through traffic down heavily residential streets. We are living each day at risk. This is time for that vision thing. Tell us how you are going to ensure your transport dept facilitates a 21st century design for our roads, our public realm and our communities that will be delivered without further delay. 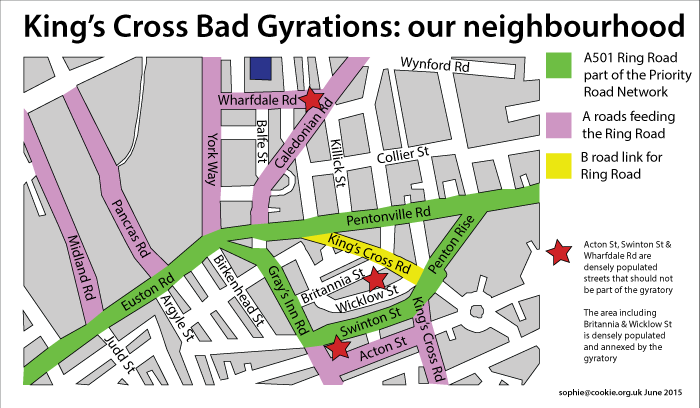 Want to get involved with the Kings Cross Bad Gyrations campaign to get rid of the gyratory? Email us by clicking here. This entry was posted in Bad Gyrations KX Campaign, Local issues, New, Road Safety in Kings Cross and tagged Gyratory, King's Cross gyratory, Mayoral candidates. Bookmark the permalink. Those of us who’ve spent many years around here know that there isn’t an easy answer that won’t annoy _someone_. The sanest answer technically is of course to take most private cars out of inner London – then the solutions to so many other problems here (and elsewhere) would fall into place easily. It’s pretty much the only _single_ thing that would unblock the logjam (conceptually and physically). It’s obvious really – but does anyone in “the system” have the political courage to say so? This is inaccurate and quite misleading. The Aga Khan University is not a University of Islam (perhaps your touchstone is the Christian theological schools that you can find in many places – AKU does not teach theology of any sort). Consider visiting http://www.aku.edu for more information. I can’t apologise enough for my error. It was ignorant of me. I was using ‘University of Islam’ because that’s how it had been described to me and I should have checked that before publishing. I have corrected the article now and included the link in the text. Thankyou for correcting me. Although the Aga Khan University is indeed not, of itself, a “university of Islam”, the part of it based here in London (on Euston Road) is the AKU’s Institute for the Study of Muslim Civilisations. So Sophie’s shorthand description wasn’t totally unreasonable and her defensiveness is perhaps not necessary. Also, although the AKU – especially at its other sites – does deal with a wide range of academic areas, it isn’t true to say, as Anony Moose does, that the AKU “does not teach theology of any sort”. For instance, Its Muslim Cultures MA does, as you’d expect, include study of Muslim theology amongst its core courses (according to its own published curriculum). 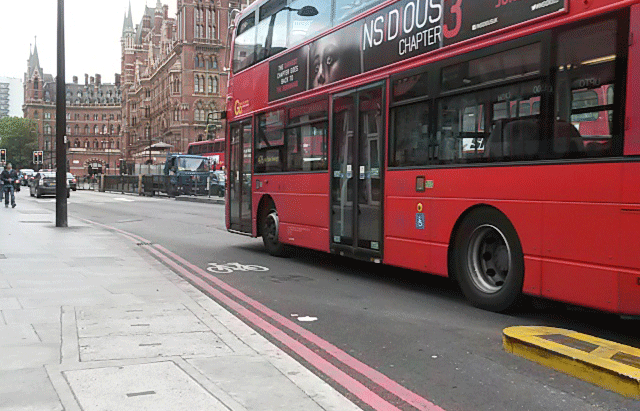 Two small items: add the A501, from the Westway to Old Street, to the congestion charge zone. And get taxis out of the bus lanes on the same stretch. A good in-depth examination of the situation. Thanks for taking the time to do all of this. I am still hopeful that the wrinkles will be ironed out and we will get a saner traffic system. tfl sound like they are trying to face both ways at the same time, their use of the term ‘induced demand’ is a classic example of bureaucratic jargon hiding their apparent priority for car drivers. Traffic smoothing only creates ‘induced demand’ when refering to motorways and ring roads, not narrow residential streets, where traffic needs to flow otherwise it creates queues with noise and air pollution. Traffic smoothing and induced demand have a massive impact on narrow residential streets. 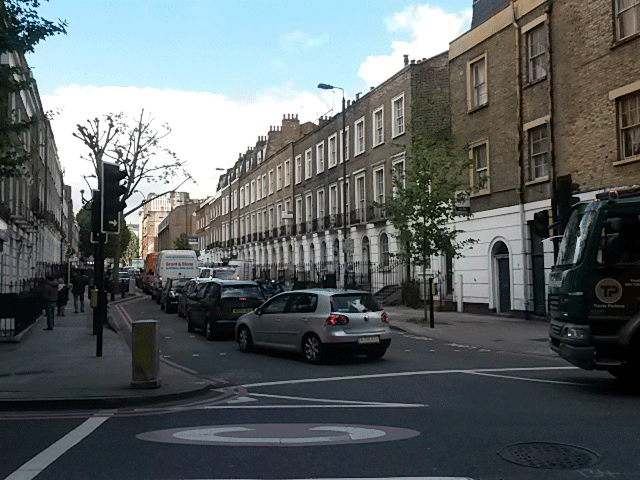 The street where we both live, Wharfdale Road is a perfect example. 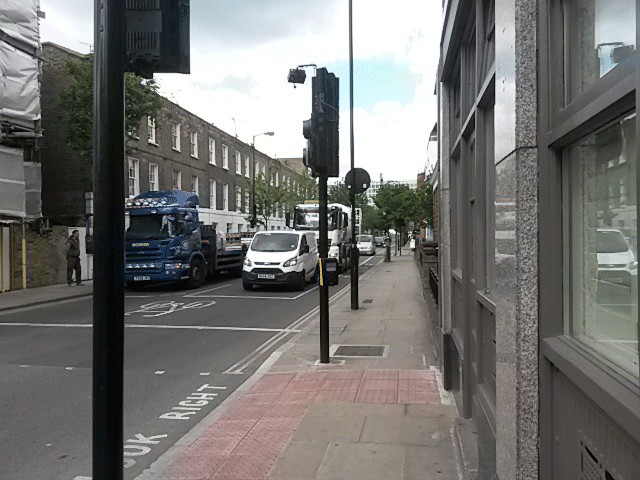 The vast majority of traffic on Wharfdale Road is only here because of traffic smoothing policy. There is very little traffic that would use Wharfdale Road were it not part of the Kings Cross Gyratory system whose sole purpose is to smooth traffic. That you live on the junction of two major A roads is the result of traffic smoothing policy. We’re campaigning to remove the Gyratory to make the whole Kings Cross area safer, healthier and more liveable by removing the Gyratory and replacing it with well designed public realm. 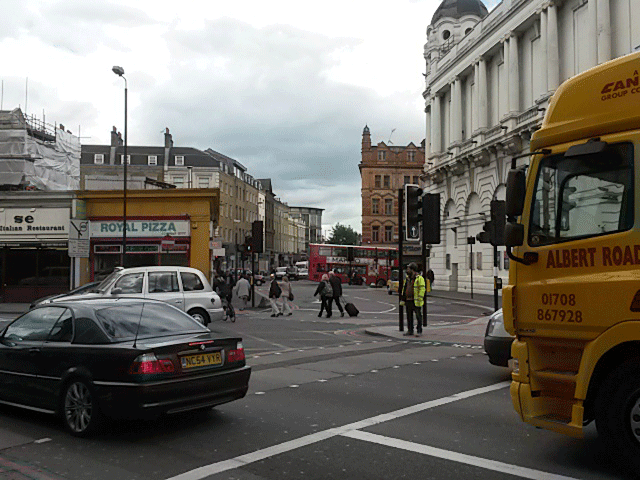 That would include removing Wharfdale Road from the Gyratory system, it would no longer be an A road. Until that happens the street we live on will continue to carry a crazy amount of traffic that shouldn’t be pushed down this narrow residential street. 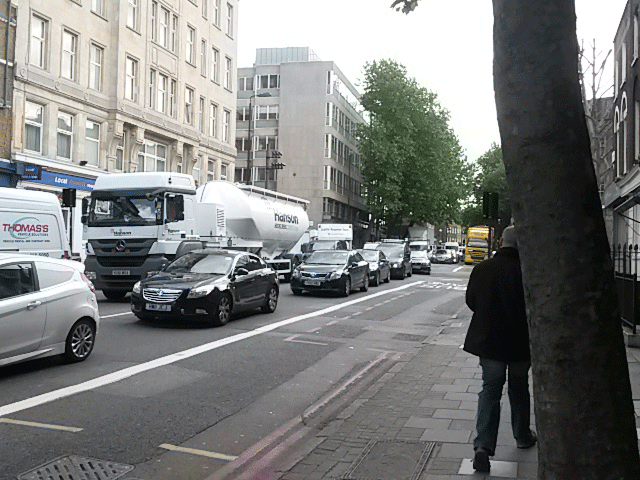 As long as there are traffic lights on my junction, there will be queues of idling vehicles, noise and air pollution.